These days, space is at a premium. Everywhere. In our homes, our offices, our cars, and our garages. And when you don't have the space for a dedicated "horse stuff" area, you're in trouble. Where do you put all that stuff? Where did that hoofpick go? How did those riding boots get left behind? And when you have to take your gear to your horse to ride, you need the constitution of a pack mule to get it all there -- and with any luck you're not too knackered to ride after the effort. One trip is usually not enough. However, with Steelcraft's new EasiGlide Mobile Tack Shed, most of the work is done for you. All you need to do is load and go. There's room on this baby for a saddle (or two), bridles, whips, brushes and bits and pieces in a handy basket, and a bucket. If you need to stack, you can. But the really great thing about this unit is its horseproof-ness and sturdiness. The makers have paid particular attention to making the EasiGlide totally safe for horses -- there's nowhere a foot can get stuck and nowhere to tangle a tail. And sturdy -- you could push it over the roughest field or yard and the tough pneumatic wheels take it easily in their stride. One similar European-made concept we tried out for comparison purposes was lightweight in construction, and prone to tipping up if not balanced correctly. Its wheels were not really up to rough terrain. 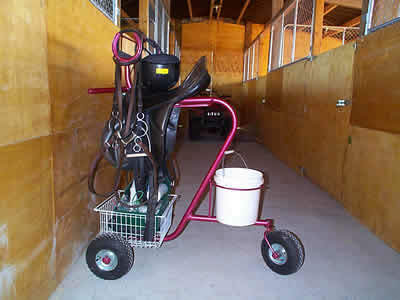 We found the EasiGlide great for storing gear -- in a busy yard without full facilities each person could have their own for transport to and from their stable or tie-up area, keeping all their gear tidily in one place. It can also double as a saddle cleaning rack. And getting gear to and from the horsefloat/trailer to go out was a breeze, with only one trip needed to get everything safely stowed. In all, the EasiGlide does everything it should and more, and, best of all, the manufacturer can make it in your stable colours.